Playa Scuba Dive Center | Tauchbasis | Centro de Buceo > Learn to scuba dive! Are you willing to learn scuba diving with professional instructors? You came to the right place! We can teach you how to scuba dive from the very beginning or, if you are already a certified diver, we can help you achieve higher education levels and goals in scuba diving. We offer you not only professionalism and dedication in teaching you but also the best prices in Playa del Carmen and Cozumel! Besides, you will learn in one of the most beautiful scuba destinations in the world, since all courses are held in Playa del Carmen.We take only families or small groups. We offer the Open Water Certification with both SSI and PADI. Both organizations are internationally recognized and training requirements for both are the same - Theory, Confined Water Training and 4 Open Water Dives. Day 1 - 8am to 6pm approx. Video/Theory + Confined Water Training. Day 2 - 8am to 2pm approx. Day 3 - 8am to 3pm approx. The cost for the complete SSI-course is 360 USD. Whenever possible we recommend completing the theory portion online before arriving. This will mean not needing to spend your vacation evenings studying :). 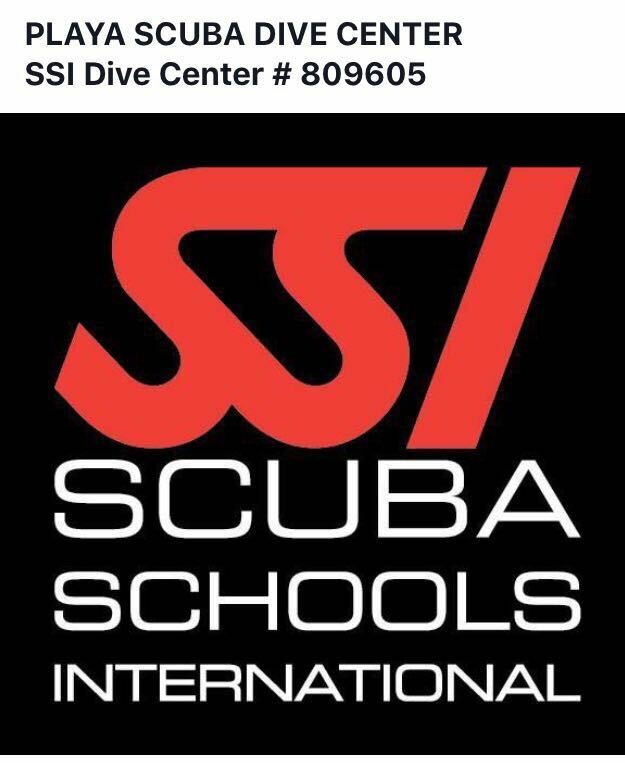 If you choose SSI, you need to log onto https://www.divessi.com/show/809605 and create your student profile and select Playa Scuba Dive Center as your dive center. You will have immediate access to the first 3 chapters of your theory. Select the Scuba Diver option in your courses and go ahead and get started! When you arrive to the shop and complete your payment you will gain access to the remaining 2 chapters of the theory, so remember to bring a tablet/phone/laptop to be able to complete your theory. We have wifi available in the shop. If you choose PADI, you can complete your theory online via PADI E-Learning https://apps.padi.com/scuba-diving/elearning/?irra=21055 This has a separate cost of 174 USD paid directly to PADI. However, if you complete your theory online, when arriving to complete the course with us you will not need to pay the 50 USD Materials fee. If you have any questions please let us know. And don't forget to get back in touch with us to let us know which course you would like to take. SSI or PADI. It includes basic lessons and a dive in open water. For this lesson is not necessary to purchase the study materials. Includes: Theory, lessons in confined water, audiovisual training, 4 open water check out boat dives in the ocean, and card-processing fee. It is mandatory to buy training materials, according to PADI guidelines. The price for such materials is $50 USD, which must be added to the course price. CLICK HERE: SSI registration-link to create your student profile or login if you are already registered. Includes four dives in open water and processing of credential. Materials need: Open Water Diver manual and dive table, log book, referral documentation completed by your initial course instructor . It is mandatory to buy training materials, according to new PADI guidelines starting September 1st, 2006. The price for such materials is $50 USD, which must be added to the course price. Begin at home and do the Padi e-learning in the comfort of your home and come here to paradise and learn how to test the NITROX mixture and calculate your dives includes two dives and cert.fees. The price is for the second portion of the course. NEW CAVERN DIVER SPECIALTY 350.-US, DEEP DIVER, WRECK DIVER, NATURALIST and many others to choose from. Includes four dives in open water and processing of credential. Materials needed: Dive table,Manual and computer. Learn to respond to and prevent emergencies under water and on the surface. Includes: OW exercises in pool/confined water, theory, and card-processing fee. A First-Aid course is required in order to complete certification. * All of our lessons are privately taught with a maximum of 4 students with each instructor. * We make sure that you will be able to learn all the needed skills to dive safely. * If you don't have your own gear add 15.-US per day on any courses. and reserve your place today! * After you click on the "Add to cart" button, you will be redirected to PayPal, where you will be able to conclude the payment of your reservation within a secure, encrypted connection. * You are paying only the reservation fee. Once we meet at the office, you can pay your balance cash before your diving / tour starts. * If you wish to dive in different places on different dates, please add each dive/date to the cart. Otherwise, just pick one diving option. * Reservation prices are in USD. Your balance is to be paid up front at the office only in cash!